Astronomers have used ESA's Herschel Space Observatory to solve a decades-old mystery about the origin of powerful cool gas winds in the hot environs of quasars. The evidence linking these powerful winds to star formation in the quasar host galaxies may also help resolve the mystery of why the size of galaxies in the Universe appears to be capped. Since their discovery in the 1960s quasars have provided a treasure trove of questions for astronomers to answer. These energetic sources – up to 10 000 times brighter than the Milky Way – are the nuclei of distant galaxies with supermassive black holes at their heart. As gas is pulled into an accretion disc towards the black hole it heats to very high temperatures and radiates energy across the electromagnetic spectrum from radio to X-rays – in this way the signature luminosity of the quasar is born. For five decades, astronomers have studied the spectra of quasars to uncover the origin of the electromagnetic radiation they emit and to trace the path the light has traversed to reach us. A valuable tool in understanding this journey are the absorption lines in the quasars' radiation spectra. These lines indicate the wavelength ranges which have been absorbed as the radiation travelled from source to observer, giving clues to the material it passed through. Over time, the study of these lines has traced the composition of galaxies and gas clouds that lie between us and these distant luminous objects, but one set of absorption lines has remained unexplained. Astronomers have observed absorption lines in many quasars that are indicative of absorption en route by cool gas with heavy metal elements like carbon, magnesium and silicon. The lines signal that the light has travelled through winds of cold gas travelling at speeds of thousands of kilometres per second within the quasars' host galaxies. Whilst knowledge that these winds exist is nothing new their origin, and why they are able to reach such impressive speeds, has remained an unknown. Now, astronomer Peter Barthel and his PhD student Pece Podigachoski, both from the Groningen University Kapteyn Institute, together with colleagues Belinda Wilkes from the Harvard-Smithsonian Center for Astrophysics (USA) and Martin Haas at Ruhr-Universität Bochum (Germany) have shed light on the cold winds' origins. 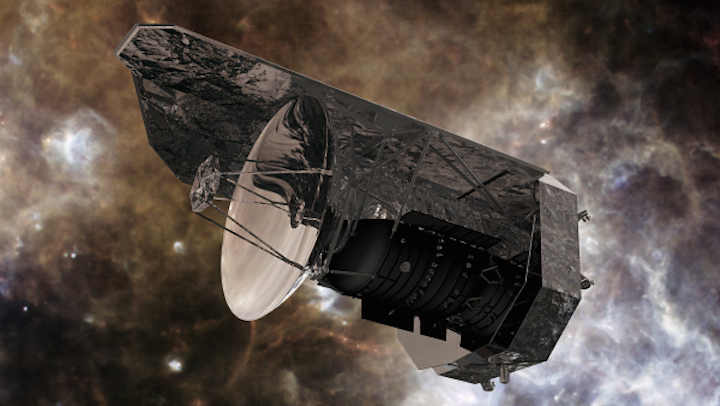 Using data obtained with ESA's Herschel Space Observatory the astronomers have shown, for the first time, that the strength of the metal absorption lines associated with these mysterious gas winds is directly linked to the rate of star formation within the quasar host galaxies. In finding this trend the astronomers are able to say with some confidence that prodigious star formation within the host galaxy may be the mechanism driving these mysterious and powerful winds. "Identifying this tendency for prolific star formation to be closely related to powerful quasar winds is an exciting find for us," explains Pece Podigachoski. "A natural explanation for this is that the winds are starburst driven and produced by supernovas – which are known to occur with great frequency during periods of extreme star formation." This new connection not only solves one puzzle about quasars but may also contribute to unravelling an even bigger mystery: why does the size of galaxies observed in our Universe appear to be capped in practice, although not in theory. "Aside from the question of which processes are responsible for the gas winds, their net effect is a very important topic in today's astrophysics," explains Peter Barthel. "Although theories predict that galaxies can grow very large, ultra-massive galaxies have not been observed. It appears that there is a process which acts as a brake on the formation of such galaxies: internal gas winds for example could be responsible for this so-called negative feedback." Theory predicts that galaxies should be able to grow to masses a hundred times larger than any ever observed. The fact that there is a deficit of behemoths in the Universe implies that there is a process depleting galaxies' gas reserves before they are able to reach their full potential. There are two mechanisms likely to lead to this depletion of gas: the first is the supernova winds associated with starbursts, the second, the winds associated with the supermassive black hole at the heart of every quasar. 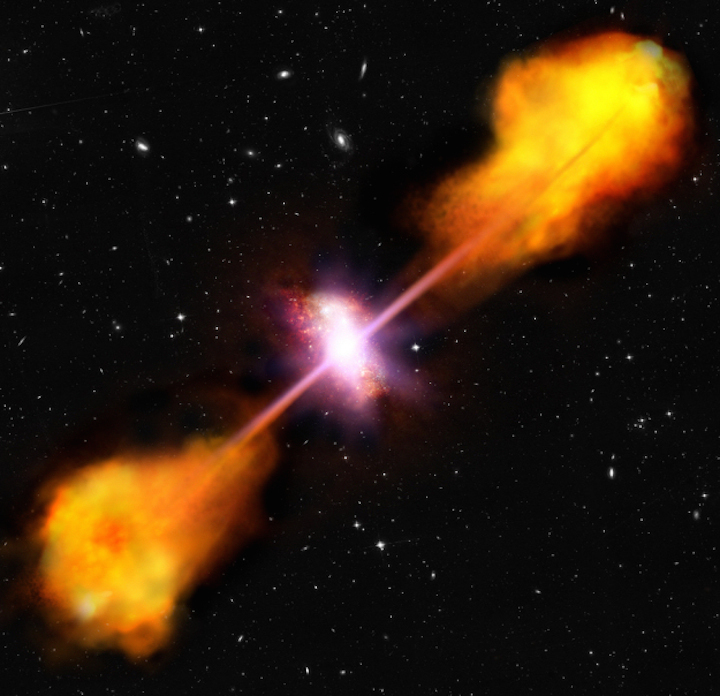 Although both mechanisms are likely to play a role, the evidence of correlation between cold gas winds and star formation rate found by this team suggests that in the case of quasars, star formation, which requires a steady supply of cold gas, may be the key culprit in sapping the galaxy of gas and supressing its ability to grow the next generation of stars. "This is an important result for quasar science, and one that relied on the unique capabilities of Herschel," explains Göran Pilbratt, Herschel Project Scientist at ESA. "Herschel observes light in the far infrared and submillimetre enabling the detailed knowledge of the star formation rate in the galaxies observed that was needed to make this discovery."